Rugby league - Siddal v Leigh Miners Rangers. Taniela Bakosa for Siddal. Siddal crushed top three rivals Rochdale Mayfield by 48-12 in the Premier Division of the National Conference League yesterday. It meant the Chevinedge men went above Matt Calland’s visitors on points difference but they remain four points behind Leigh Miners Rangers, who were 30-20 home winners against West Hull. Gareth Greenwood’s men roared into a 20-0 lead in little more than half an hour. Shaun Garrod set the ball rolling with the opener after only two minutes and fellow backs Taniela Bakosa (two) and Gavin Stead added to the tally with Stead kicking two conversions. Mayfield received a boost two minutes before half time with a try from winger Declan Sheridan, who went on to complete a hat-trick and score all his side’s points with scrum half Sam Butterworth unable to land a goal. 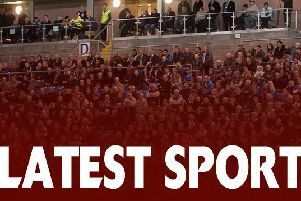 Danny Williams got the second half scoring under way and although Sheridan made it 26-8 on 50 minutes, converted tries by Scott Caley and Jack McComb put Siddal out of sight at 38-8. Sheridan struck again but Siddal, with centre Chester Butler to the fore, added their eighth and ninth tries from Gareth Blackburn and Craig Sanderson. Stead finished with six goals. Elland remain hovering just above the drop zone in Division One after a 35-22 home defeat at the hands of Pilkington Recs. They were on course for an upset when they led 16-8 at half time but the visitors then took command to inflict a fourth successive league defeat on the Greetland-based outfit. Illingworth won 20-14 away to Skirlaugh Bulls A in the Yorkshire Men’s League Premier Division. They trailed 8-0 in the second half but came through to win with tries from Jack Bradbury, Kieran Nicholson, Kev Smith and skipper Andrew McElroy, Luke Sutcliffe adding two goals. It means Illingworth have finished second and will meet neighbours Ovenden in the play-offs.